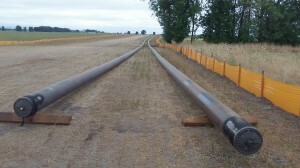 Pipe ready to be buried south of Walnut Drive in Linn County. Note the orange sheeting. Up and down the mid-Willamette Valley, along country roads and across grass seed fields, crews have been digging or boring into the ground to bury long sections of 12-inch diameter steel pipe. You can see part of the work in progress off Walnut Drive and Riverside Drive south of Albany as well as along Corvallis Road south of Independence. It’s all part of a multimillion-dollar project by Northwest Natural, the regional gas company, to increase its capacity to serve customers. The work began last year on a segment of new pipeline to serve Corvallis. This year it has continued on a segment east of Riverside Drive. Company press releases say the pipelines are to be finished this year, and the cost was estimated at upwards of $40 million. In a rate decision in the fall of 2012, the Public Utility Commission disallowed about $22 million in expenses for two segments of the overall project in Polk County, meaning those costs cannot be charged to ratepayers.